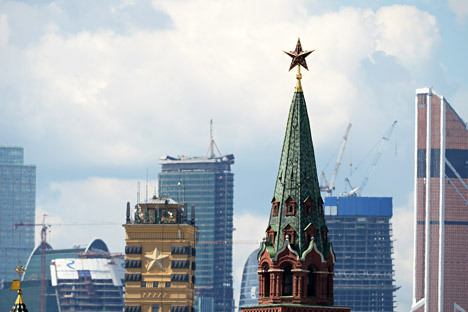 Russia moves ahead of its fellow BRIC countries in the World Bank’s latest Ease of Doing Business ranking, as the country fights to attract international investment. Russia jumped 20 places in the World Bank’s Ease of Doing Business survey to number 92 out of 185 countries following a concerted reform effort and widespread improvements in access to electricity, according to a new report from the international body. The results bring the country closer to meeting President Vladimir Putin’s goal of bringing Russia from 120th place to 20th place by 2018 through a series of “road maps” designed to reduce bureaucracy and cut red tape. Today’s results show the first tangible signs of success as recognized by a major international body. Russia edged ahead of China in the index, which placed at number 96, and placed higher than any of its peers in the so-called BRIC club of large emerging economies comprised of Brazil, Russia, India and China. Brazil moved up two notches to 116th place, while India dropped three places to 134th. The improvements came as a result of a "huge reform effort," said Rita Ramalho of the World Bank, according to The Financial Times. Russia made significant progress in improving access to electricity, jumping ahead 71 places in that category, the World Bank said. Russia also advanced 29 places in the ease of registering property. Its weakest sectors remained construction permits, where it languished in 178th place, and trading across borders, where it ranked 157th. Oleg Budargin, CEO of the Federal Grid Company, noted that, in electrical reliability as measured by the number of outages, Russia had already surpassed many developed countries. Outages in Russia last an average of 0.9 hours, compared to 1.7 hours in Europe and 3.3 hours globally. “We've reduced the cost of an electricity connection by three times, from 9,500 rubles in 2009 to around 3,000 rubles [about $93] today. This has led to a subsequent increase in applications, from 200,000 then to 416,000 in 2012,” Budargin said. Meanwhile, Ruslan Davydov, Deputy Head of Russia’s Customs Service, noted that data for the current study was collected back in March and that indicators for international trade would see a major improvement in next year’s index. “We’ve reduced the number of days it takes to import products by seven and to export them by six. Next year we’re switching to 100% of customs documents being processed online. By 2018, our goal is for the entire import/export process to take no more than two hours,” he said. A number of experts have pointed out that Russia’s common economic space with neighbors Belarus and Kazakhstan – set to become fully operational in 2015 – could push companies to invest there instead of Russia to better take advantage of the 170 million consumer market. Belarus took 63rd place in this year’s study while Kazakhstan came in at 50th, making the need to reform all the more urgent. Meanwhile, Kazakh President Nursultan Nazarbaev has suggested expanding the Eurasian Union to include countries like Turkey and Armenia. “A study by UBS AG and Campden Research earlier this year noted that excessive regulation and corruption had practically not improved since 2012. So it’s too early to celebrate; right now we should be cautiously optimistic,” he said. “Foreign investors won’t save us from anything in the end. We need to foster an environment where Russian businesspeople are investing in production rather than just collecting dividends. In the end we’re going all this for ourselves,” said Nikitin.